What will you teach your kids about money through your actions? Your children are watching you. Not in a creepy way, just in an observational way. And let me tell you, children pick up on a lot of little things (behaviors, beliefs, traits) from their parents. If you want to teach your kids about money, there are a few things you should be aware of first. Firstly, they learn about money through the lessons we're intentionally teaching them. Our oldest child, Andrew, recently saved up some money to buy a remote-controlled race car. He knew the price of the toy, and as soon as he had enough money to purchase it, we took him to the store. When he got to the aisle, he found a different race car he liked better. All was good, right? Well, not so much. My wife could have easily said, “Oh sure honey, it's just a dollar.” But did she? No – and for good reason too! We want to teach our children how money works in the real world. We want them to understand how to earn money. We're certainly not our children's credit cards. No, we're their parents, and we're going to do our best to give them the skill set they need to survive – and thrive – in society! Lauren asked Andrew to do four simple chores to earn the dollar. At home that day, Andrew did the chores faster than ever, earned his dollar, and Lauren drove him back to the store to buy the race car he earned. The result? Andrew was able to take pride in the fact that he earned and deserved the race car. Had Lauren not given him that opportunity, we would have thought about the purchase very differently. Look for opportunities like this to intentionally teach your child about money. This is the scary one. Your children are soaking up into their little brains everything you're doing. And many times, they'll learn lessons from your behavior even when you think you're not teaching them anything. Consider the simple act of swiping a debit card. How does that look to a young child? Does the child understand that money is being transferred to the merchant? After all, nothing is physically being handed over. To a young child, it seems magical. Daddy just puts a card through the machine and gets all kinds of stuff! If a parent overlooks situations like this, they'll be teaching their child lessons they'd never in a million years teach them intentionally. That's another reason why there is so much value in switching to a cash budget… for your sake and theirs. When it comes to spending habits, everyone has them. Some habits are great to have; others, not so much. Take inventory of your spending habits. How do you spend your money? When do you spend your money? Where do you spend your money? Teach your kids about money in an intentional way, through your actions. If you're starting to realize you need some work in these areas, don't become discouraged. These best practices take exactly that: practice! I know as a parent, I'm continually finding ways to improve myself and the way I deal with money. The truth is, children will point you out on your hypocrisy and will learn more from what you do than what you say. 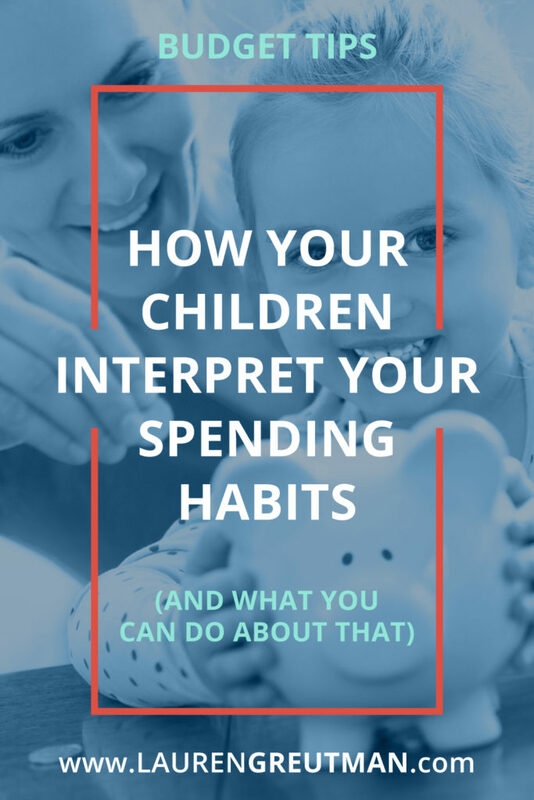 Children start out interpreting your spending habits on a simplistic level and gradually begin understanding your actions on a more sophisticated one. How you deal with money communicates to them how you feel about your family, how you think about work, and how you prioritize your ambitions. Not only will the money lessons you teach your children today affect their future financial choices, they are sure to affect your pocketbook, too. Some college graduates have been known to move back in with mom and pop. Some adult children borrow from their adult parents due to poor financial decisions. These things happen. Whether you want to learn how to budget or learn more about teaching your kids about money, we have the tools and resources for you. We believe you can radically change your family's finances for the better and ensure your kids look at money from the proper perspective and dream Big! Be sure to let us know in the comments section about your spending habits – what do you need work on and where do you excel? How do you teach your children about spending?